I am sure you know of Terry Fox . . . even if you are not Canadian. Terry became famous for his Marathon of Hope ~ a cross-Canada run to raise money for cancer research, which Fox ran with one prosthetic leg. He is considered one of Canada's greatest heroes and is celebrated internationally every September as people participate in the Terry Fox Run, the world's largest one-day fundraiser for cancer research. Terry's goal in 1980 was to raise $1 from every Canadian as he ran across the country. To date, more than $400 million has been raised worldwide for cancer research in Terry's name through the annual Terry Fox Run, held across Canada and around the world. 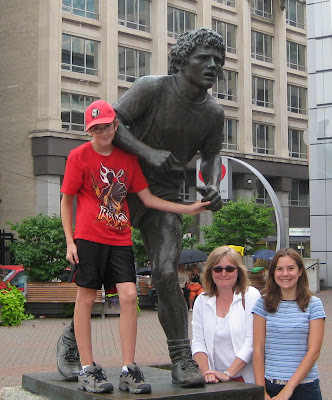 Each year Canadian children participate in school hosted Terry Fox runs. This year the run is on Friday, September 25th, 2009. The same day as my son's 13th Birthday. I will make my donation this year in honour of Deb's mom (Land of Nod Studio's) and Carolyn's Dad (Draffin Bears) . A cure for Cancer is within our reach. What a great cause he will be participating in. Thanks for sharing this. It's so very important! He really was an outstanding individual. I remember being glued to the tv to watch him. It is great it is still going on every year. Take care. Have a fun weekend. What a wonderful event! Thanks for sharing it! Many thanks for your kind donation to this wonderful cause. Also for remembering Deborah's Mother and my Father, thank you. Cancer needs to be eradicated and I hope that a cure will be here soon. Wishing your Son a very happy 13th birthday.